Having a store of clean drinking water is one of the most important and crucial components of resiliency-building and emergency preparedness. It has been said many times that a person can live for three weeks without food but only three days without water. There are many emergency situations and events that can cause your everyday water supply to become unavailable or undrinkable. The unexpected natural disaster or perfect storm will typically wreak havoc on the powergrid. When widespread power outages occur, water may not flow from the tap, or treatment plants may not be working to properly treat and deliver safe water. It is events like these that we all must prepare for. Here we explore ways to ensure you are prepared to meet these types of situations without much effort or concern. Keep in mind the recommendation that you have one gallon of water per person per day for emergency situations. I personally try to store three gallons per person for my family to ensure that we have water both for drinking and for all the other activities in life that require water (cooking, dishwashing, sanitation, and water for the animals and plants). Although there are many things to consider when developing a water storage plan, taking a few simple, low-cost steps to build up a store of water is easier than you think. The following ways to store water will hopefully provide you with the insights and methods to make the process a whole lot easier. Water can be stored for a very long time if prepared properly (6 months to 5 years, depending on the preparation method). Water is heavy and can take up a lot of space (one U.S. gallon = 8.34 pounds; 5-gallon container = 41.7 pounds plus the container). It is recommended that you have two gallons of water per person per day. Try to store a minimum of a 3-day supply. So for a family of four, that would be 24 gallons of water. Light and air are not good for water. For long term storage, always try to use opaque, airtight containers and store them in cool, dark spaces. To prevent water from growing bacteria and other bugs, use water preserver or bleach solution. It is recommended that you rotate your water once a year for freshness and check on your water supply every month to ensure that leaks or contamination have not occurred. Water containers can be stored in many different places such as closets, underneath beds, etc. Get creative, but keep in mind that a leaking container can give you a whole lot more headache than you planned for. Be mindful of possible water damage issues. We will now cover five different ways to store water and build more resiliency into our lives. Gallon-sized jugs can cost as little as $1, sometimes less, and can come in cases of 6. The heavy-duty cardboard boxes stack easily and protect the jugs from rupture and light exposure. Lighter and easier to transport. Good for emergency grab-and-go needs. Easy to store in cabinets and other small spaces. Chemicals may leak from plastic containers during long-term storage (seek out BPA-free bottles if possible). It's not recommended to reuse bottles for drinking water. 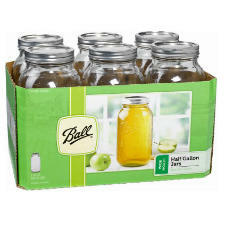 Thought most resources do not recommend using glass jars for water storage since jars are more breakable than their plastic counterparts, I find that having a few gallons in ½ gallon canning jars to be a practical and convenient way to have easily accessible water for short term water outages. We keep three gallons of filtered water available in the pantry (stored in the original half-gallon case with extra cardboard padding between the bottles) and rotate them in and out by using them in the car as part of our everyday carry car kit (one gallon in the car at all times). The water is always fresh and there is no need to worry about chemical leaching from the container in hot conditions. Most folks who begin to learn about storing water will come across containers specifically designed for water storage and transport on the medium scale. These containers are made of polyethylene food-grade plastic and designed to withstand stacking and storage for long periods of time. They usually come in volumes of 3.5 to 7 gallons. They are opaque and can be used and re-used multiple times. Most are BPA-free and have less risk of leaching chemicals into the water during storage. 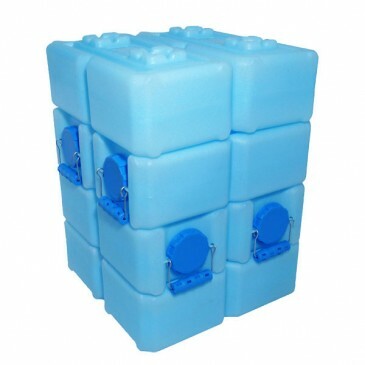 I have used many versions of these containers, and my current recommendation is the WaterBrick System. They come in a 3.5 gallon size that makes them easier to carry and pour from. As another advantage, their wide mouth allows for them to be used to easily store dry goods instead of water if desired, making them a dual-purpose container. The shape of the waterbricks also makes them easier to fit in tight places (under the bed, for instance). The WaterBob is a relatively new and innovative way to safely store a large amount of water when a natural disaster is anticipated or an emergency situation is in progress. 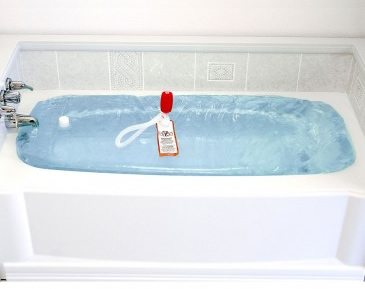 You place the bladder in the tub and fill it with clean water while the supply is available and reliable. Then dispense the water with the included siphon pump. The bladder system can hold up to 100 gallons of drinkable water for short-term durations (not meant for long-term storage). The only issue with this method is that you need to be prepared in advance and aware of when a possible emergency is going to happen so you can fill the WaterBob before the water supply is compromised. Easy to store in the bathroom where you will need it. Large volume for multi-day supply of fresh water. I hope these ways of storing water have shown you that is easy to take the steps necessary to build water resilience into your life and prepare for the unexpected. Start small and build up your supply. And please post your own ideas and experiences in our comments section below, and share other ways you are storing water "just in case." Investing a relatively small amount of effort toward water storage can mean great peace of mind and improved success during an emergency.